I have always been interested in the so-called “soft” and “inner” styles emanating from Asia. Shortly before completing my business administration studies in Regensburg I came across a leaflet in the cafeteria about the martial art of EWTO-WingTsun. I found this leaflet extremely interesting, as I already had a copy of the book “116 wooden dummy techniques” by Grandmaster Yip Man in my martial arts library, and studied it intensively although I did not own a wooden dummy myself. Moreover, I always considered the book “On Single Combat” by GM Keith R. Kernspecht to be required reading for any martial arts instructor. I still read and study its contents today. The next day I immediately attended my first WT lesson, and introductory session that immediately convinced me to learn this fascinating martial art. There are no techniques, only an overriding principle, a few functional sub-principles and just a few forms as examples. The undoubtedly ingenious system of ChiSao, with its constant and intensive training in the perception of tactile impulses and unconscious reactions (= EWTO programme ReakTsun) is unique. It is simply unrivalled in the martial arts world, the very heart of this art, the left and right ventricle. This is what convinced me to “stick” with this art. An immense amount of time is needed to acquire a feeling for this technique-less structure, and to entrust oneself to the teacher. When starting to learn WT you always want to be better or more active, but this is definitely the way to impede your own learning process and impose pressure on yourself. Most of the fundamentals are embedded in the forms, and I enjoy practicing these first thing in the morning. I find all the many biomechanical options for using body tension and relaxation absolutely fascinating. It gives me moments which enormously impress me anew, and makes me “thirsty for more knowledge” on a tactile level. 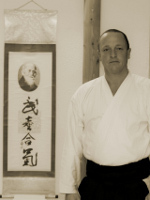 The inner WT of Grandmaster Kernspecht is change within change, an aspect that traditional arts heavily oriented towards techniques cannot follow. I still remember my first lessons in PoonSao very well. This was a very profound experience, as such a training method was completely unknown to me. The technical aspects of the systems taught by many traditional martial arts fail to take into account the brutal thug who acts without rules. I was privileged to experience the introduction of the BlitzDefence programmes by GM Kernspecht, and can state unequivocally that this methodology and the principles it contains were an absolute novelty in the martial arts world, and in my view the focus on the opening phases of a conflict is absolutely unique, as it shows precisely what happens “out there”. From the first student grade onwards, a well-founded strategy is already taught for personal self-defence. Nonetheless, it is still the individual with a corresponding mental attitude and physical constitution who decides the issue. In this connection I consider the emphasis on the “Big Seven” to be an important foundation. There are nowadays any number of self-defence books, but they have not adapted to the brutal realities of these times. Looking at the world of the traditional dojo, you learn many rituals, practices and ethical principles that belong to a long bygone age. There were once certain rules, and respect. These rules, and the resulting respect for the “loser” do not exist in dark alleyways. As martial arts instructors we should always keep this in mind, and so should those who train for sporting competition. The street is not a dojo or a ring, there is no opponent who obeys rules, and no referee who will intervene when there are injuries, or break off the fight in case of serious injury. As a representative of a robust Aikido style heavily influenced by an intensive weapons system, I began to give great thought to the reality in the street the more I learned in the EWTO-WT system. I certainly do not want to call the rituals and ethical principles of my art, which I have been practicing for a long time, into question, as they have taught me respect, loyalty and humility. I always treat my sensei and my students with the greatest recognition and respect. Our training has been passed down to us as the life’s work of an old warrior and strategist. However, social developments and the ever-increasing factor of disrespectful behaviour clearly reflected by brutal conflict situations do not always offer sufficient “survival” scope for these ethical principles. Right from the start, the WT system showed me by “feeling” that it contains the ultimate solution to the brutality encountered in such conflicts. Inner WT gives the attacker absolutely no chance of a defence, and in my view this further heightens its efficiency and clear superiority. I would be lying if I claimed that it was easy for me to let go and question things I have learned for years in my traditional martial art, but as a teacher my principle must always be: learn, learn and learn again, and I think that this openness should be a fundamental attitude for any martial arts instructor. At this point let me thank my Sihing, Sifu Michael Stopp (3rd Technician grade), head of the WT martial arts schools in Upper Franconia, who teaches me with patience, calm and boundless energy. It is also a great honour for me to have been accepted as a private student of GM Kernspecht.